A blog about my interests, which include crazy quilting and various and assorted other artsy pursuits and sometimes known to contain mumblings of a random nature. Many of us are concerned and wondering what to do about the imminent loss of our Google RSS feeds...how are we going to keep up with our favourite blogs (including...ahem....this one!). There have been a couple of really interesting articles posted lately on a couple of the blogs I read, and so I thought I'd point you in there direction so it can help you make a decision. Many blogs, including this one, have a feature somewhere (mine is waaaayyyy down at the very bottom!) where you can subscribe to get posts through your email. It's one more option you have. Another one of my favourites (also happens to be done by a good friend). Unfortunately I couldn't get far enough back to get a really good picture. There were a couple of quilts using these bird images..
completely in tune with the Oriental style. There will be another episode tomorrow! The pattern is the 'Gadabout' from Studio Kat Designs. It measures approx. 9 x 9 x 3 1/2 inches and has LOTS of pockets. I have added an extra pocket (which shows in the pictures above on the back) simply because I goofed and made one too many pieces of crazy quilting that I didn't need. Couldn't let it go to waste so decided to simply make another pocket so I could use it. This week I'll be showing a few pictures of the quilts that were at the local quilt show on the weekend. The mysterious black project I've been working on is nearing completion and hopefully there might be pictures of that to be seen tomorrow. Stay tuned! 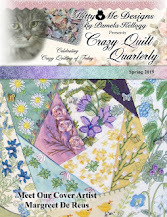 I am so excited to be able to tell you that the latest issue of Pat Winter's 'Crazy Quilt Gatherings' magazines is now available! There's an extra degree of excitement for me because my article about my hussif is in this issue. The cover was designed by one of my friends - Pam Kellogg (and the cute cat design is included in the magazine). There's also an article in there written by one of THE best-known crazy quilt artists - J. Marsha Michler. To say I'm in good company is the understatement of the year!! I've had a wee peek inside and am so anxious to get my copy in my hot little hands. If you want to own one for yourself, just click on the picture of the cover in my sidebar and it will take you to Pat's blog where you can find out how to place an order for either a print or digital version (or both!). Can you tell I'm over the moon?? For the food portion of this post, thought Id show you the box of produce we picked up today....all of this goodness for only $15. We were a bit disappointed that there wasn't any asparagus or rhubarb included, but you can be sure that we will happily consume what we got! We spent the weekend re-doing our bathroom. As usual, I forgot to take a 'before' picture, but trust me, it wasn't a thing of beauty! The people who are in charge of our apartment building painted it before we moved in and decided that every square inch of it should all be blue....walls, ceiling, door....everything. I like blue (it's one of my favourite colours actually) but having it surrounding you on all sides was a bit more than I could handle. Our bathroom is re-a-l-l-y tiny - typical of an apartment I guess. The tile, tub, and vanity are all old - probably dating back to when the building was first built about 35 years ago. The tile is basically white with stylized flowers in blue and gold (or what passed for it in those days). The counter top is a blue-ish grey marble arborite. Nothing 'goes' with anything else. I brought home dozens of paint chips trying to come up with something that would work, and finally settled on a dark brown. The top picture is more true to the actual colour. We replaced the medicine cabinet above the sink (the other one was rusty beyond repair) when we first moved in and also picked up the additional storage cupboard that sits above/around the toilet. On the opposite wall we have just put in a new towel rack (MUCH nicer than the generic one that was there before). The 'tree' above the towel rack was a $2 find at a local store. It was meant originally to be a candle holder and we removed the candle holders in favour of just the tree. The only thing I want now to complete the re-do is something decorative for above the cabinet....I'm envisioning something with a touch of greenery in it and perhaps in the same style as the piece (a thrift store find) that the figurine stands on. It's hard to tell from these pictures but the shower curtain is a white background with circles of blue, gold and brown which tie in with the colours of the tile and the paint. Go HERE for further info. I'll give you what little history I know (at least for now) on the blanket. It is made of 100% wool - very scratchy and definitely not something you would want to have tucked right up under your chin at night, despite the wonderful warmth it would give. 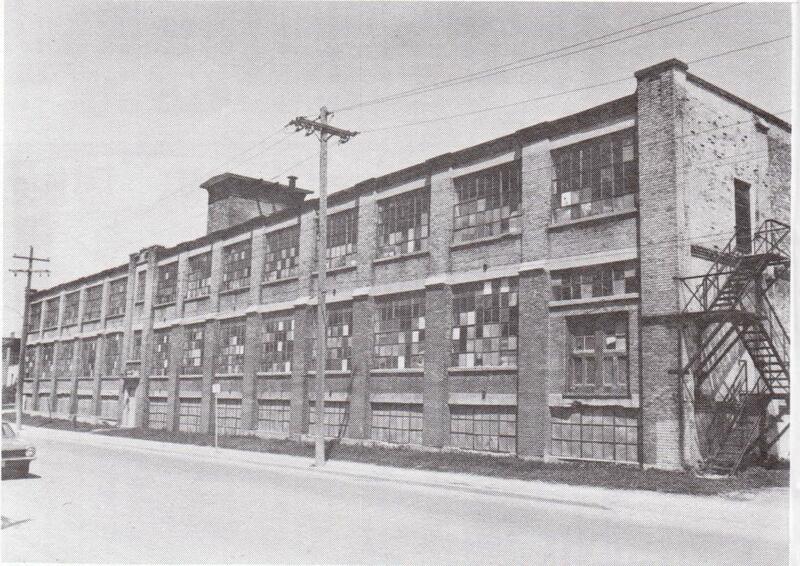 It was made here in this town at the Horn Bros. Knitting Mills whose building has now been turned into apartments. My mother-in-law worked there - probably in the early 1930's. The building itself is only about a block and a half away from where we currently live. I haven't been able to quickly locate much further information on the Horn Bros., but I did find a picture of the building as it looked before it was turned into apartments. The picture, unfortunately, is undated. The blanket itself is in wonderful condition for being so old. The binding has become quite worn and Jan very carefully removed it and gave it to me. I will be able to re-use it to rebind it, although it won't be as wide as the original. Thank you SO much Jan - we will treasure this! I have added the little floral sprigs here and there, along with the wee butterflies on the left. The insect on the upper right is a button cover. 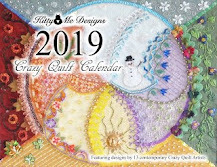 Further on crazy quilting and embroidery my friend Pam Kellogg of Kitty and Me Designs has just released her new book and I'm so excited to know that mine is on the way. I already know I will be making good use of it. Go HERE for further information and to order a copy for yourself!! You can also see a picture of her new kitten, Wrigley. Thank you, Shawn and Winnie!! One of the sections on my current crazy quilting project is nearly done. Here you can see a button cluster (bottom of first picture) and there's a real blingy button on the bottom picture, stitched down over top of a metal flower meant originally for scrapbooking. The bling didn't show quite as bright as it is in real life. * TUSAL (Totally Useless Stitch-A-Long); ORTS (old recycled threads). If you would like to know more about the TUSAL challenge, click on the link in my sidebar. Let's see....the seam on the lower-ish left is partially taken from one of Pam Kellogg's books, with the addition of the beads. The little 'flower' just to the right of that is another from Pam. I added a beaded necklace to the image and surrounded it with bling (part of a rhinestone necklace) and topped it off with a button. Picture is clickable to enlarge if you so desire! Above is a seam treatment from the first 'Elegant Crazyquilt Seam Treatments' book by Pam Kellogg of Kitty and Me Designs. It's done using the waste canvas technique, which is one of my favourites. BTW - there's a rumor afoot that there's soon going to be a new book available from Pam. I can hardly wait!! The seam below is from 'OuttaMyHead' designs*. *for those of you who haven't figured it out - that's moi!! Seems to me I'm seaming! Oh well, with the aid of allergy medications, eye drops, and saline solutions I'm surviving the onslought of those miserable allergens. - can you imagine knitting plants? Neither could I, until I stumbled across THIS. Be sure to look at all the pictures! - and Sandy of Quill Cottage has a free crazy quilt cuff class going on at THIS blog if you're interested. Looks like fun! I don't mind if you pin my work, but I would really love it if you would either link back to my blog or give me credit! Playing nicely is a wonderful thing!! Please think of me if you happen across any wonderful old abandoned buildings in your travels (particularly barns, wooden churches and houses). I'm searching for images to use in my work and am throwing it out to you for help in finding them! 60+ mother of two grown boys and two lovely daughters-in-love, wife of one, and now happy to be a grandmother of 2 wonderful little boys. . Always been interested in crafts of all sorts.